Home » car » Honda » lucky » lucky draw » offline contest » Parkson » purchase » qna » spend » travel contest » vouchers » Parkson SHOP2WIN Shopperriffic Contest: Win Honda Jazz, Holiday Trip (to Shanghai, Qingdao, Bali, Ho Chi Minh City) and many more prizes worth over RM300,000! 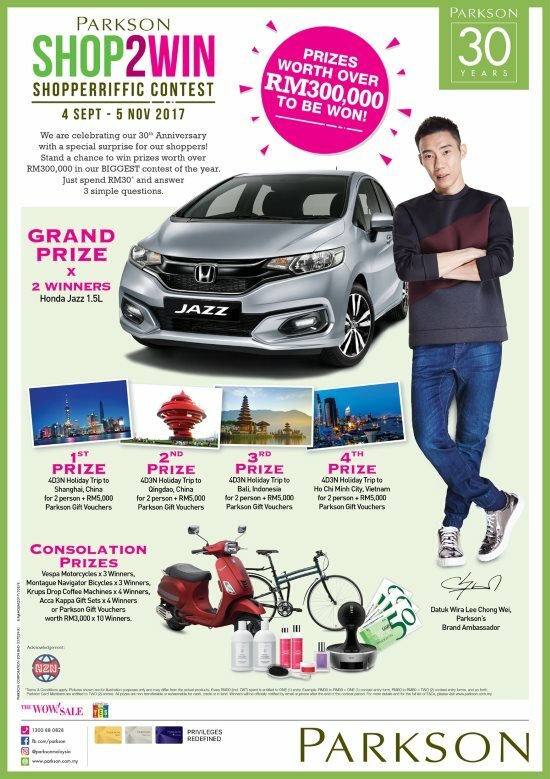 Parkson SHOP2WIN Shopperriffic Contest: Win Honda Jazz, Holiday Trip (to Shanghai, Qingdao, Bali, Ho Chi Minh City) and many more prizes worth over RM300,000! Get ONE (1) contest entry form with every purchase of RM30 (incl. GST) in a single receipt within Contest Period. Answer 3 questions, fill up your details and drop your Contest Form into the Contest Box at any Parkson Customer Service Counters no later than 10.00pm on 5 November 2017. Visit Parkson SHOP2WIN Shopperriffic Contest page for more details.